With the proper attachments and a KitchenAid stand mixer, I’m quite confident that each of us could save the world. To spread good cheer, baking joy, and just because I’m deliriously in love with my stand mixer and want you to have one too, I’m giving one away today. 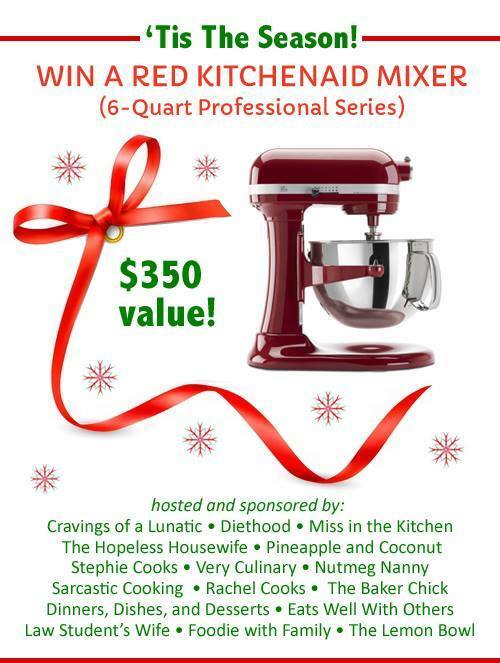 A group of bloggers and I teamed up to offer one lucky winner a KitchenAid 6-Quart Professional Series 6-Quart Stand Mixer in holly jolly holiday red. I’ve been in a blissful relationship with my 5-Quart Artisan Series Stand Mixer for years, and the giveaway mixer is even more top-of-the line. I’m so excited to be spreading the stand-mixer joy, I want to squeal, bake a giant batch of Gingerbread Cinnamon Rolls (kneaded using my stand mixer dough hook of course), then wash it down with a round of Andes Mint-Stuffed Sugar Cookies (mixed with my can’t-live-without-it beater blade–stand mixer owners, you need this gadget). Totally normal. Here’s to saving the world, one batch of cookies at of cookies at a time. I’m delighted to be sponsoring this giveaway with the other hosting bloggers. AMAZING giveaway! Thank all of you!! Thank You, for what and all that you do. Thank you so much for the giveaways. I have wanted one of these for years and I am sure others do to. Somebody is going to be really happy this Christmas! I can’t live without my KitchenAid mixer. This is an AWESOME giveaway, Erin! Erin, I tweeted, but can’t find the info to give you the link, and it won’t let me tweet again. This is driving me crazy…. I’m excited for this contest. I can see double batches of cupcakes I’m making for my son Rob’s wedding in September! Over 150, and they have to be transported out if state! Yikes! Erin, thank you for your words of wisdom, recipes and this marvelous giveaway! I have wanted a Kitchen-Aid stand mixer forEVER! Just haven’t made the investment! It would make baking, cooking, making ice cream and pasta sooooo much easier! (especially this time of year!). Thank you again! I agree with what everyone else has said! I would love one of these mixers but haven’t had the funds to make the investment! Love all your holiday recipes!